If you are visiting Southeast Alaska one of the first questions you might be asking yourself is, “where can I see bears in Alaska?” Well, look no further, as I am here to guide you on exactly how to make that happen. From Skagway to Ketchikan to Juneau bear viewing tours, we have you covered. To begin your trip planning, I should mention that bears are most prominent in the months of July through September (information from Natural Habitat Adventures), so please keep that in mind as you peruse our Alaska bear adventures! First things first, we can never predict or guarantee ANY wildlife sightings during your trip or on your excursions with us! We strive to give back 5% of our sales to charity, this year to the Alaska Conservation Foundation, and we love protecting Alaska and every creature inside of this glorious State. Please remember, do not approach or interact with any bear you spot along your journey! By the way, since you seem to be a wildlife enthusiast, click here to check out all of our Wildlife Viewing excursions, including some of our Alaska bear adventures! Experience the thrill of seeing wild bears in Alaska! Nothing quite compares to the thrill of catching your first glimpse of an Alaskan brown bear. Our first stop along our search for the perfect Alaska bear adventures takes us to the northern tip of the inside passage. Skagway Alaska, a historic gold rush town, is surrounded by vast wilderness and just a short drive from Canada’s famous wilds, the Yukon Territory. All this untamed land, combined with moa more arid climate (less dense trees), makes Skagway a wonderful spot to spy your bears in Alaska! It’s all in the name. 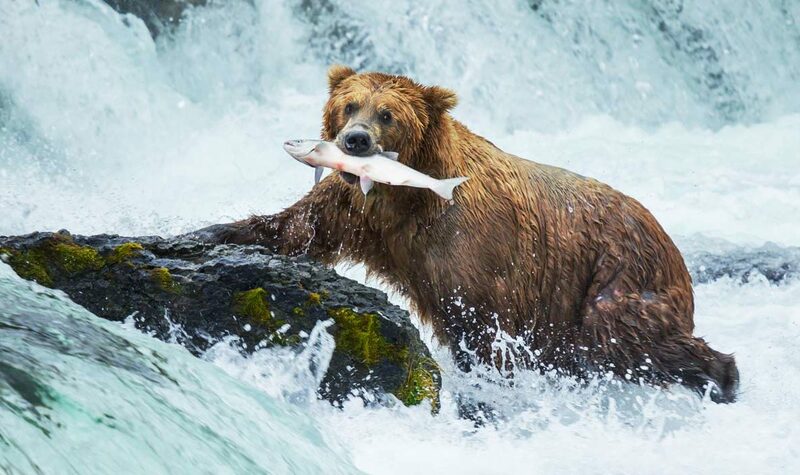 Skagway’s Wildlife Safari and Bear Viewing tour is a perfect tour to see Brown bears doing what bears in Alaska are known to do: eating salmon! If you’d like a little more history to go along with your Alaska bear adventures, check out the scenic and culturally rich Yukon Discovery tour! Both the Yukon Discovery and the Yukon Discovery & Sled Dog tours will take you along the famous Klondike Highway into Canada and the to legendary Yukon! This beautiful scenic drive is favorable for bear sightings. Last time I took it, I saw mama black bear and her 2 cubs hanging out in a tree! Personally, these tours are among my favorite for the opportunity to see bears in Alaska, the comprehensive sightseeing experience, and the low price point. With it’s high elevations and drier climate, Canada’s Yukon territory is prime for spying bears through the less-dense trees! Calling all of the thrill-seekers looking to get away from the crowds! This thrilling excursion visits a remote Glacier via ATV’s, with plenty of opportunities for wildlife sightings along the way. This tour is especially known for brown bear sightings due to its remote location just across the border into beautiful British Columbia. I personally love the escape from the crowds that the ATV gives you, and wha a better way to see bears in Alaska than away the wilderness! This tour is unique to Skagway and features some of the best views for all of the adventurous souls. Keep your eyes out on this exciting excursion! If you’re lucky the Glacier 4×4 Adventure is a great opportunity to see bears, eagles, mountain goats and more. Juneau: Alaska’s historic capital city, a prime area for glacier viewing, and an ideal location for Alaska bear adventures. As such, Juneau bear viewing has to be among my favorite areas for its excitement, exclusivity, and adventure. While we only offer one true tour Juneau bear viewing tour, trust me, it’s worth booking this one early! The quintessential experience of Alaska bear adventures comes out of Juneau. Pack Creek is the prime spot for Juneau bear viewing as Admiralty Island has a 1 Alaskan brown bear per square mile, and Pack Creek is where they all go to feed! As such, the Admiralty Island Fortress of the Bears Kayak is by far our most exclusive tour. Only 24 guests can enter this territory per day during peak bear season, making for truly special & wild Alaska bear adventures! So, my suggestion here is to book as early as possible, because this Juneau bear viewing tour is worth the price tag. You will board a float plane for the 25-minute flight to Admiralty Island for Juneau bear viewing at Pack Creek, where you can view Alaskan brown bears in their natural habitat. Next, you will kayak along the coastline toward your next bear-viewing destination keeping your eyes out for various other wildlife sightings, because it would be a true Alaskan adventure without a few eagles! This incredible Juneau bear viewing tour even includes a delicious picnic lunch and concludes with float plane ride back. (Prime Juneau bear viewing time is July through August). After your Juneau bear viewing experience, our last stop on the journey is Ketchikan! Known as the “Salmon Capital of the World,” Ketchikan is a prime lunch spot for bears in Alaska, making it the perfect place for more Alaska bear adventures. Your Alaska bear adventures are best served with a side of solitude. Floatplanes are the perfect way to get your group out in the wilderness with Alaska’s wildlife. Brown bears aren’t the only species of bear lumbering around alaska! Black bears are also very common throughout the last frontier. Of course, this is just a short synopsis of some of the excursions we offer that have seen bears frequently! You better BEARlieve there are plenty of opportunities to see bears in Alaska that are not mentioned above! Jordan is our sales guru, originally from upstate New York, who moved out west for the mountains. She lives for wine, high heels, and a good piece of pizza.